Left ventricular hypertrophy (LVH) is regarded as the key biomarker of hypertensive heart disease and integrated marker of cardiovascular risk reflecting cardiac alterations induced by hemodynamic and non-hemodynamic factors operating in hypertension. The pathogenetic mechanisms responsible of LVH remain incompletely elucidated. Elevated blood pressure (BP) is the main trigger of events leading to LVH development and diastolic/systolic dysfunction; also, growth factors, cytokines, neurohormones, and ethnic/genetic predisposition play a relevant role in this process. Alterations in LV diastolic and systolic function in hypertensive heart disease are related to development of structural and functional abnormalities involving extracellular matrix, fibrous tissue, vessels, and cardiomyocytes themselves. 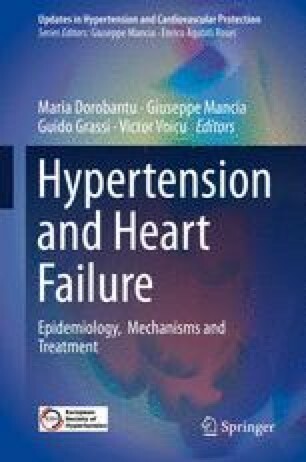 In this chapter, pathophysiological mechanisms and clinical correlates of LVH (and its subtypes) and diastolic/systolic dysfunction will be reviewed.